I'm not sure if my instagram/facebook post led you to this one but I'm happy it did! This is probably one of the toughest posts I've ever written. It's not a braid tutorial, it's not a post about love or how great life has been lately. This is a very vulnerable topic for me to talk about but.. we're here so lets get to it. When I was 15 I was diagnosed with depression. I was consumed with death and the idea of not existing. I remember waking up most days just not wanting to do life anymore. I had an abundance of great friends, and a supportive family - but unfortunately no one understood what was going on inside of my head. I saw a therapist for a few years on and off because I didn't believe medication was the best route for me. I'm very hard headed and wanted to prove I could do things on my own, so conquering depression was a task I tried to take on. When I turned 19 I started dating someone new, Alex. A true teddy bear with the biggest heart. He got me through so much of my depression. It was around that age when I was (mis)diagnosed with Endometriosis. I was seeing an OBGYN that I just didn't clique with. When I turned 21 I became very confused with the way my body felt. It was like I woke up one morning and I was swollen and heavy. I would cry for days to Alex, and he prompted me to see my doctors, all of them - so I did. A thousand blood tests and exams later yet they still found nothing. Alex agreed to workout and eat healthy with me to see if I just needed to step it up to the max. We ate clean, and went on runs but I kept gaining weight. I was the heaviest I had ever been. My normal weight of 125lbs was now 176lbs. In September 2016 I was fed up with my body. I was eating clean (paleo diet), working out at least 4 days a week, and even when my body wanted to be up and about at 3am - I made sure to be on a strict sleep schedule. I was doing everything my doctors, peers, and family told me to do but somehow that wasn't enough. I would look in the mirror and see someone I didn't recognize. She wasn't the Megan I knew and loved. She was someone who looked similar but lacked confidence and a smile. 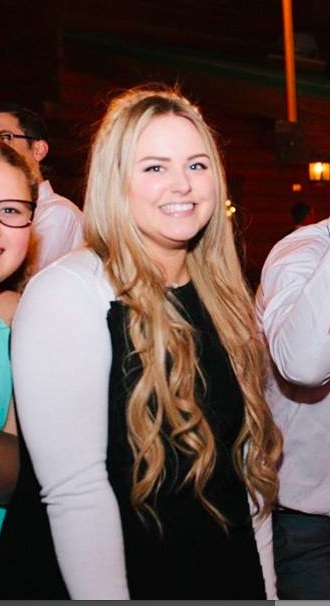 Weight gain (52lbs) in less than 3 months, depression, anxiety, exhaustion, and a few other symptoms that - all together - had me feeling so lost. Then.. MY SAVING GRACE. My sister started to see a new OBGYN that was in the same office as my other OBGYN. I decided to give her a shot. That day I walked in expecting to get the same response as I had the last 8 doctors visits, "you just need to workout and stop eating sugar" (lol) but I didn't. She pulled my chart and noticed the weight gain and could see the tears in my eyes as I stepped on the scale for the 50th time. She pulled me into the office and sat with me for 45 minutes asking me questions and taking notes. She asked me to get labs done and a pelvic ultra sound as soon as possible. To make along medical story short, two days later I was diagnosed with PCOS. Polycystic Ovary Syndrome. PCOS explained everything. The weight gain, the depression & anxiety, and everything else that was wrong with me. She prescribed me some medication because PCOS is treatable not curable. I was seeing her every 2 months for pelvic ultrasounds and I also went vegan. Within 3 months I lost close to 25lbs. In January 2017 I went through another wave of horrible depression. That continued to get worse over the course of 6 months. I moved to New York City at the end of April and went through a lot that I'm not quite ready to share. I stopped eating completely and developed a pretty nasty eating disorder that had me passing out occasionally. I would stay awake because of insomnia. I felt my relationships dying, and I felt like I was back in square one minus 60lbs. I was taking a medication for anxiety almost daily which isn't recommended by the doctor who prescribed it. My parents were cool enough to fly me home to California for the 4th of July 2017 so I could spend some time with family. It was then that they realized how unstable I was. I was the skinniest they've ever seen me and it was more apparent to me. I went back to NYC for a couple weeks and then decided it was time to give up on the city that was once my biggest dream. A friend flew me out to Aspen to spend a week - to detox from the horrible place I was in, totally blessed to have been able to do that. Nothing but crying, writing, listening, whole foods, and nature. It was great. In August 2017 I flew form NYC to California. Still horribly depressed and malnourished. My sister invited me to Santa Barbara to help move my nephew into college. Another very long story short - I met someone who literally changed my life. I went back the following weekend because my brain was confused by all the happiness I was feeling. I wanted to eat again. I wanted to smile. I wanted to make sure this feeling wouldn't wear off, so my friend and I hopped into her car and took a little road trip down to Santa Barbara. I experienced a lot of new things that weekend. But I went home with a smile on my face, a tattoo on my wrist, and a new human to love. You know me, I love to love humans. I now, finally, feel like I have my depression handled, my weight is normal, and I wake up every day wanting to experience life. I want to help people and encourage you all. To wrap things up - I want to let you know why I wrote this post. 1. Most of my friends back home didn't understand why I was icing them out during those painful months in NYC. I was so depressed I didn't care to have support anymore. So my friendships were reflecting that. They saw my instagram account, filled with cute coffee shops, and new clothes, but didn't see how lost I was. I didn't let anyone see how depressed I was because I simply didn't want to. So if you're going through something, I can say based off experience - tell your people you're in pain. Tell them you're hurting. I promise they can help. 2. I was told by doctors that I was absolutely fine for months on end. I knew I was not "fine" and I knew there was something off with my body. I encourage you ALL to bug your doctors, therapists, etc. if you think something is wrong. I'm very in tune with my body, so making sure your listening to yours is my biggest piece of advice. 3. I wrote this post to open up a little more to you all. There are so many people on this planet who are so unaware, so I want to make sure that I'm opening eyes every chance I get. 4. I can only hope to become a roll model for whoever needs one. Please ask me questions. Tell me things you want to tell me. And promise me you wont give up on yourself. I didn't give up on myself, and believe me, I was scary close to that point. But guess what guys? I met someone (one single person) who changed my life and made me want to live. Life always gets better. I'm slowly getting the hang of living with a chronic illness. It takes a lot of focus on what I put into my body, how much rest I'm getting, etc. Below are some photos to check out. The first 3 are last year May 2016, and the following 3 were taken during August/September 2017. The one of me looking sunburt, with salty beach waves, and a fresh tattoo was probably one of the best days of my life.